My morning routine in recent weeks had consisted of hauling myself out of bed, pouring cups of coffee for the two senior members of the household, and helping get the kids ready for school. That, and listening to the news on the radio. With all that goes on to upset a lover of peace and nature these days, I counted myself lucky when a mother hooded merganser turned up near our house in a small pond, surrounded by marsh. She had a contingent of hatchlings keeping close to her, and if Mama Merganser had her way, you could tell nothing could keep them apart. This sweet scene, on offer every morning, offered an irresistible alternative to the news. So I began launching my days out in the marsh. The following images were all captured there. In the gathering of them, I found my spirits rising, my blood pressure subsiding, and a welcome serenity---I began to think of it as marsh mellow---seeping into my soul. I should add that serenity was only achieved with the help of lemon eucalyptus insect repellent, and lots of it. A mother wood duck and ducklings, much more secretive than the mergansers. A beautiful sedge in bloom. Can any Carex expert out there help me with identification? A fiddlehead of royal fern, unfolding at the edge of marsh and pond. A mother tree swallow, guarding her brood in a nest in a tree hollow. The trunk stands beside the marsh. A prowler! Early one morning, I surprised this eastern chipmunk, six feet up in the expired red maple in which tree swallows were nesting. Chipmunks are nest predators. Happily for the birds, the chipmunk fled, and the swallows remain on duty. 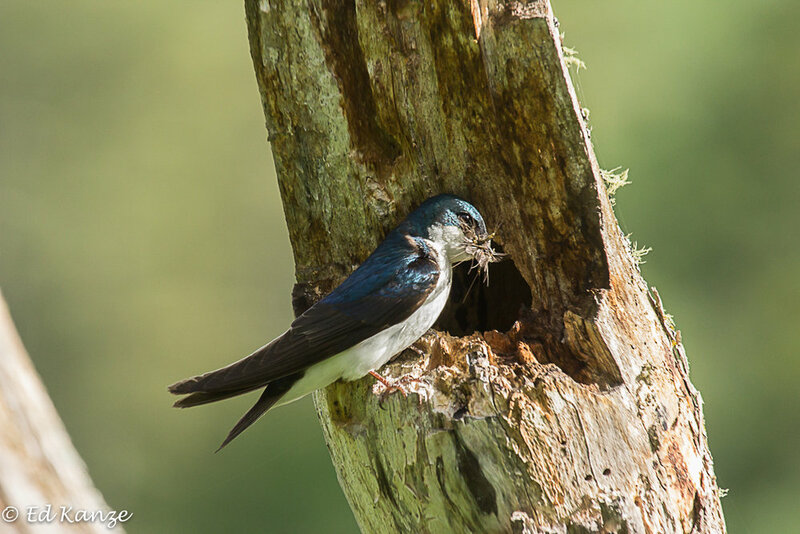 A few days after Father's Day, Papa Tree Swallow arrives at the nest with a mouth crammed full of mayflies. 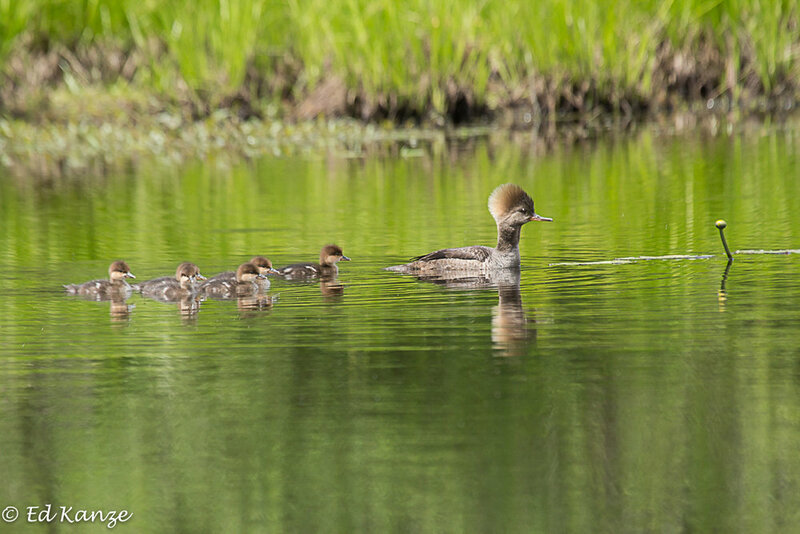 As I was photographing the hooded merganser family, a head popped up like a Jack-in-the-box. A whitetail doe was studying me. 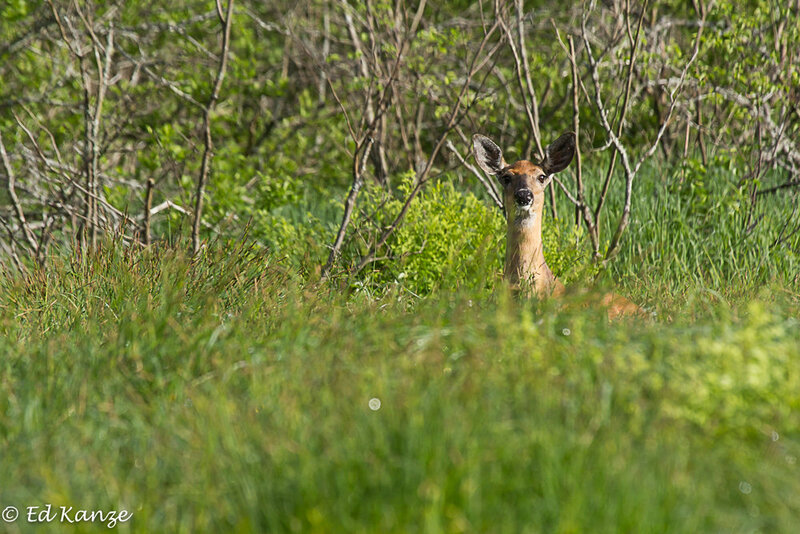 The doe crept closer and closer, curious and apparently puzzled about my identity. Then, I suspect, she caught my scent. No, not my scent---the scent of my insect repellent. With a snort and a few bounds, she was gone. 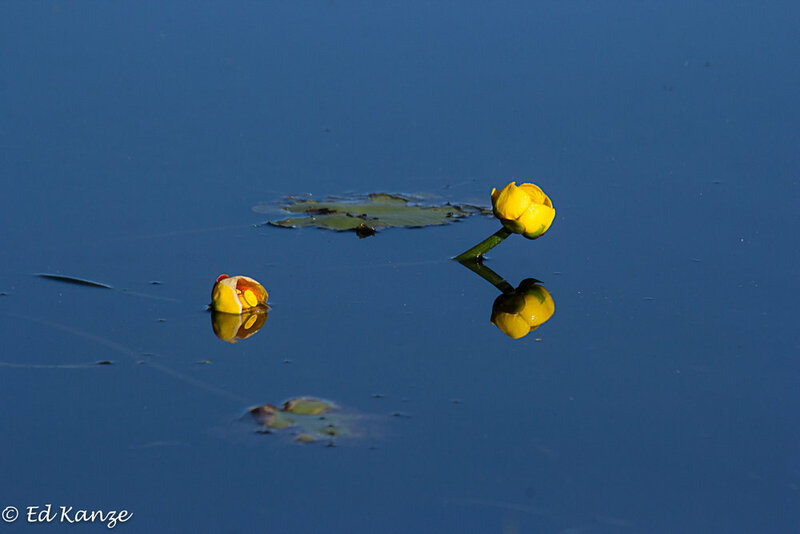 Yellow water-lilies in bloom, their stems rising out of the pond's mucky bottom. Cedar waxwings kept busy in and around nearby shrubs and trees, snatching insects from the air before shooting off to gather wild strawberries for dessert. A wild blue flag, an iris, blooming at the edge of the marsh. Mama Hooded Merganser and her brood providing another morning of psychotherapy.